Prominent & Leading 100% Export Oriented Unit from Jaipur, we offer prune red and pink kantha work fruit printed bed spreads, multicolor cotton fruit printed kantha jaipuri bed sheet, kantha work printed cotton bed spread, star moon embroidered mirror work cotton designer bed linen, cotton paisley printed kantha bed cover and paisley printed kantha bed linen single bed sheet. We are offering our customers an excellent quality range of cotton Bedspreads Rajrang presents wide range of Indian designer Kantha Work Bedspreads. 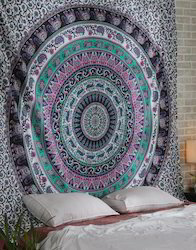 We Providing You a Best Range of Printed Bedspread. This Beautiful Bedspread Has Made From experienced Craftsmen and Given a Ethnic Rajasthani Look. Beautiful Bed spared made of soft cotton cloth. Traditional Quilts has made from experienced craftsmen. We are offering our customers an excellent quality range of cotton bedspreads. Rajrang presents wide range of Indian designer Kantha Work products. We Providing You a Best Range of Kantha Work Bedspread. 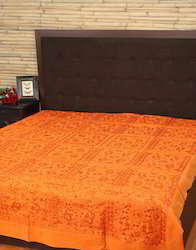 This Beautiful Bed Spreads Has Made From experienced Craftsmen and Given a Ethnic Rajasthani Look. Description : We are offering our customers an excellent quality range of Cotton Bedspread. Rajrang presents wide range of Indian designer Kantha Bedspread. This Beautiful Bedspread Has Made From experienced Craftsmen and Given a Ethnic Rajasthani Look. • Beautiful Bed spared made of soft cotton cloth. • Traditional Quilts has made from experienced craftsmen. "Rajrang brings you the soft and designer bed linen set for your bedroom. This Cotton embroidered bedspread is soft to touch and smooth to feel. The great Embroidered all over the bedspread. The graceful and contemporary bedspread that is perfect to use in the Spring and Summer season. The Embroidered bedspread brings brightness to the room. It is durable and made of sturdy fabric. Description : Wholesale Bedsheets. 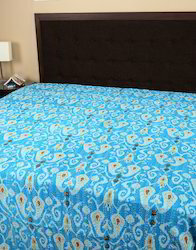 Our company is dealing in manufacturing, supplying and exporting a wide range of Traditional Kantha Bed covers. 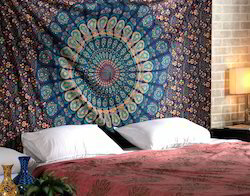 These Vintage style Printed Bed spread makes u feel good. We make these Bedspread available in varied colors, patterns and sizes to suit the requirement of the client. Description : Our company is widely appreciated in the providing Handmade Jaipuri Applique Bed Cover. Each Cotton Bedspread is a unique piece on its own. it is Available in various color, combinations and easy to maintain. We are catering wide range of printed bed Spreads. These beautiful products are designed with high quality raw material. Excellent machine quilted Bed Spread is available in many sizes and colors to match the aesthetics of household ambiance. We are offering our customers an excellent quality range of bedspread. Rajrang presents wide range of Indian designer Applique Work Bedspread. This Beautiful Bedspread Has Made From experienced Craftsmen and Given a Ethnic Rajasthani Look. We are offering our customers an excellent quality range of Cotton Bedspread Rajrang presents wide range of Indian designer Kantha Work products. We Providing You a Best Range of Kantha Bedspread. This Beautiful Bedspread Has Made From experienced Craftsmen and Given a Ethnic Rajasthani Look. Beautiful Bedspread made of soft cotton cloth. Give your bedroom an instant makeover with this Blue and green colored Printed bed spreads from the house of Rajrang. Having exemplary kantha work with Floral print all over crafted with premium quality cotton this bedspreads is a must-have.